Chapman's Peak Drive is one of the most spectacular coastal roads in South Africa and the world. It links the seaside community of Hout Bay to the Noordhoek Valley along the Atlantic Coast, with breath-taking views from along the narrow, winding road blasted into the cliffs. Constructed in 1915 and upgraded many times since, the six-mile (9km) route took about seven years to complete and was built as a shorter, alternative route between Cape Town central and the South Peninsula. 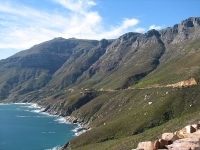 Many visitors use this scenic route to reach Cape Point Nature Reserve, situated at the tip of the Peninsula. But for many Capetonians, it simply comprises a breathtakingly beautiful commute to work. There are a number of gorgeous picnic sites and viewpoints along the route and it is very popular with cyclists. Chapman's Peak Drive is also the ideal vantage point for whale watching, the peak whale season being mid-August to mid-November. Hiking up Chapman's Peak and through Silvermine Nature Reserve and the Cape Peninsula National Park offers spectacular views over the South Peninsula. With sheer cliffs below, soaring mountains above, and the ocean stretching to the horizon, this dramatic stretch of road is a must-see for tourists in Cape Town. Admission: Chapman's Peak Drive is operated as a toll-road. Light motor vehicles cost about ZAR 45.